Truck Helpers are the heart of our pick-up and delivery operations. 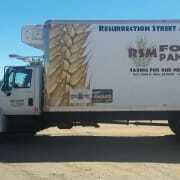 Helpers accompany our truck drivers to assist with loading and unloading food and donations. We need 1 - 2 helpers per truck, each day. This program is ideal for someone who has no major physical limitations and can be physically active for most of the shift. Please come and help us. Serve, learn, and grow! · Openings available Mon - Sat, 4-5 hours per day. Minimum age 18. · Operate an automated lift gate, hand pallet jack or cart. May lift 50 lbs. or more. Orientation and training provided. · Prefer a minimum commitment of 1 day per week or several a month, but we’re flexible. Min of 1 day per week. We're f;exible. Compassionate, self-motivated, hard worker, sense of humor, flexible.